The imaginative world of Dr. Seuss comes to life like never before in this visually spectacular adventure from the creators of Despicable Me! Twelve-year-old Ted will do anything to find a real live Truffula Tree in order to impress the girl of his dreams. As he embarks on his journey, Ted discovers the incredible story of the Lorax, a grumpy but charming creature who speaks for the trees. 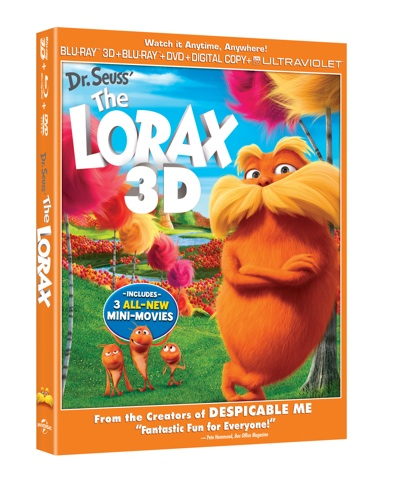 Featuring the voice talents of Danny DeVito, Ed Helms, Zac Efron, Taylor Swift, Rob Riggle, Jenny Slate and Betty White, Dr. Seuss’ The Lorax is filled with hilarious fun for everyone! To be honest, I didn't really think the movie sounded all that great myself. Even as a huge fan of two of the voice talents- Zac Efron and Taylor Swift- I had no real desire to rush off and watch it, but my son had been talking about it for a few months and so when I was contacted asking if I'd like to receive a copy to review, I jumped on the chance. My little guy is extremely picky, so when he actually wants to watch something new, you don't pass that chance up!! He was so excited when it arrived that we had to watch it immediately...twice!! Despite my initial skepticism, I surprisingly found myself really enjoying the movie as well! The colors are nice and bright, you can't help but watch and there are some great musical numbers throughout the movie as well. (Of course, that should have been expected with the cast!) Those two things together were enough to grab both my attention lacking son and myself!! One of my other initial thoughts upon reading the synopsis was that the story sounded quite similar to Wall-E, and while there truly were a few similarities, they are also completely different as well, and I thought The Lorax was probably more 'kid friendly'- as in more fun with the music, colors, fun characters, etc. It was a great message about how we can all make a difference in our environment, and very relevant in today's time. Overall, I loved the movie, and Shaun loved it even more. In fact, even after watching two times on that first day, he has still been asking to watch it daily! !